Today's GDP release is boring, so I'm going to talk about something else. You may be wondering why Canada is reporting data for November two days later than the USA is reporting data for the whole fourth quarter, see story here, for example. The Bureau emphasized that the fourth-quarter "advance" estimates are based on source data that are incomplete or subject to further revision by the source agency (see the box on page 3). The fourth-quarter "preliminary" estimates, based on more comprehensive data, will be released on February 28, 2008. Well, what sort of revisions does the American data get? Well, this information is helpfully provided. From these 'advance' estimates to the preliminary estimates, which correspond to Statcan's release of the December data, the absolute mean revision is 0.5%. Annual revisions and the like over the years add up to an absolute mean revision of 1.2%. With this release of monthly GDP by industry, revisions have been made back to January 2007. Maybe we should consider learning a thing or two from our neighbours. Here's my question. Suppose we plant identical professors of economics in different locales. One, in the middle of the Harvard-MIT-NBER triangle. The second, alone in a mansion with internet access and the world's greatest economics library on the edge of the Great Bear Lake. I've heard conspiracy theories that getting published is all about the pedigree of your Ph.D. and your current affliation. Neglecting this (as I really hope it isn't true), what's the benefit of being surrounded by amiable professional relations? This worries me, as I (eventually?) want to return to Newfoundland. How can we go about judging these worries? I've never been much for co-authoring, but I can imagine the benefit from daily conversation with people pushing the edges of their field. Good research ideas have to come from somewhere. Stanford has conveniently posted several bountiful crops of honours essays. Some of these documents compare very favourably with my own (still under construction). Admittedly, the variance is large. If we controlled for Stanford pushing their students more than MUN, the fact that Stanford allocates a longer period of time to these projects, different goals of the projects, etc, etc, and left only the environment (and maybe advisors? ), would there still be a large gap in quality? I'd say that it would close, but not converge, and is likely more pronounced for faculty than students. Either way, something I've thought about. For those of you keeping track of such things, the graduate admissions season was started today with Ohio State, UT-Austin, and Rutgers all announcing admits, pre-empting Minnesota from their traditional kick-off. Either that, or the early Minnesota admits simply don't hang around the right parts of the internet. Frankly, there just hasn't been much to talk about recently. Did anyone else notice the free trade deals with Peru, Lichtenstein, Iceland, Norway, and Switzerland? If you didn't, you know now. The only reason a post is forthcoming here is because classes were cancelled this morning due to snowstorm. Ironic, right? The report I mentioned yesterday has arrived. Basically, there's no news. We had some weakness a month or two ago, but it's mostly flat this month. You will not find answers here, anyway. The Globe, however, looks like it could be worth picking up today. Some interesting stories, besides the typical writedowns-equity-rate cuts stuff. Now, there's about as much point in me talking about interest rate cuts, fiscal stimulus, stock markets, etc, as there is in hoping that St. John's won't see any more snow this year. Many people can be found to talk about such things, and many do it better than I can. Econbrowser comes to mind. Either way, we did have two data releases. One, retail sales were strong, even though if it was mostly consumers demonstrating the fact that, yes, gasoline is an inelastic good. However, the numbers were still decent. Two, EI recipients were down in November, by 5,800 from October. Yes, given how quick this descent has been, November is effectively years ago. However, Statistics Canada has balm for this uncertainty - the monthly report on leading indicators comes out tomorrow. I do speak from experience, to some degree. A lot of studies came through our group, and people with backgrounds in political science, sociology, english, etc, were picking these things apart on the basis of their technical merits. It was, at times, like shooting fish in a barrel. C.D. Howe is often pretty good, but aside from that, nothing really comes to mind. Many, many grains of salt. UPDATE: Here's one particularly egregious example. The study shows that from 2002 to mid-2007 the terms of trade rose by 22.3%. Real GDP, which excludes purchasing power changes from the terms of trade, rose 15.1%, an average of 2.6% per year. Real GDI, which incorporates the rising Canadian purchasing power, rose 23%, an average of 3.4% per year. The terms of trade improvement was responsible for roughly 8 percentage points, or one-third, of real income growth. Source is today's Daily. On a personal note, I remember running across the terms of trade effect in introductory macro and being completely confused. I guess I've made some progress. This CBC article suggests that even if the Bank of Canada cut rates, banks wouldn't follow suit and cut rates to match. Welll...this is either wrong, or says that there's a not a huge degree of competition among the major banks. Let's disregard sticky prices - changing the interest rate on a loan is not something that requires a long time to accomplish. I do accept that the market is perfectly competitive, but with five players, all of whom have relatively similar cost structures (not a shred of evidence to back up this belief, sorry), the oligopoly model of your choice should keep the spread close to where it was following a rate cut from Ottawa. Should the banks refuse to follow the central bank's lead, it wouldn't make borrowing any cheaper, making the Bank of Canada's rate cut largely ineffectual. Ted Carmichael, chief economist at JP Morgan Securities Canada, said it would not be unprecedented for this to happen. "It simply means that if the [Bank of Canada] desires to reduce borrowing rates for consumers, home buyers and businesses it has to make larger reductions in its policy rate," he said. I find this misleading. Presumably if the banks have the collective power to stand firm on a full (quarter-point, presumably) rate cut, it makes little sense to find that a half-point cut would permit a quarter-point decrease in rates to 'trickle down', if you will. At least, I can't think of any market model in which price changes act in this manner. POSTSCRIPT: Given the volume of posts while I was working at HRSDC relative to the number of posts while I'm engaged in studies, does anyone want to try and estimate the value I place on earning a doctorate from a good school? It's been awhile since we've had any meaningful Canadian economic data put out, so let me talk about the just-released Labour Force Survey. All of the employment losses in December were among employees in the private sector, leaving gains for this group of workers up a tepid 0.4% over the course of the year. Gains for the year were mostly in the public sector and self-employment. And predominately in the public sector, I might add. (110k public sector v. 22k self-employed.) This trend, which I've noted before, worries me. It's not a sign of a recession, and doesn't mean anything at all in the short run. However, it's clearly unsustainable over the longer run. One of the few worries I have about the Canadian economy as a whole. I hate doing this, but Greg Mankiw has recently put out two exceptional posts. On foreign economics curricula and economic growth. If you haven't already, go read them both. For those in the know, Economics 4999 designates the undergraduate honours' essay in economics at Memorial. I plan to use this space to share any insights I gain from my scintillating psuedo-research and keep myself on track. Thus, this will likely be a continuing series, to some degree. Basically, the plan is economic growth in Newfoundland. This consists of two parts. One, econometrics applied to the GDP time series for the province, two, application of the Rodrik/Hausmann/Velasquez 'growth diagnostics' approach. Original paper here, blog entry here. Yes, this is an econoblogosphere-inspired honours' project. Anyway, I'm in the process of sketching the outline and learning the requisite mathematics, namely optimal control theory - my third macro course was completely discrete time and dynamic programming (used Romer), so this continuous optimization thing is new. NOTE: For those of you wondering where my promised Christmas paper is, it's under development. Typesetting a paper in LaTeX necessitates actually learning LaTeX, which made it slow going at first, and motivation is hard to come by over the holidays. Now, as far as I know, (Full disclosure: no formal training as a biologist, biochemist, geneticist, or any related profession), there shouldn't be any reason why it would be more complicated or costly to trace one's bloodline on one side of your family as opposed to the other. 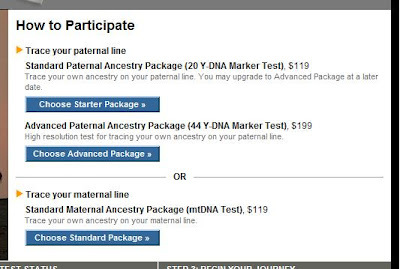 Since I can't think of any reason for the market to lie, I guess people place more value on their paternal blood, or that their demand curve is more inelastic than for tracing their mother's ancestry. I can see the advanced package being in high demand for questions of succession in certain countries that practice primogeniture, for example. Given the massive volume of polls that had come out, a move of this magnitude in the market says to me that a lot can happen. Though I guess political markets are the first place one looks for animal spirits. NOTE: Image from Intrade. Click to expand. UPDATE: If anyone knows a good text that covers Hamiltonians, please feel free to leave a comment. I was surprised that Simon and Blume had nothing. It's also a bad sign that the government allowed oil prices to hit triple digits. In theory, policy-makers understand the importance of the psychological threshold and try as hard as possible to avoid crossing it. If they weren't able to avoid $100 oil, then perhaps the economy is in a worse state than we realize. I am not convinced that there is anyone in American goverment whose job it is to manipulate the price of oil. Even if there were, I think there are very few tools that can be used here, and certainly no short-term ones. Probably no long term ones, either, unless you believe the American economy is going to become an increasing share of the world economy, which seems unlikely. I would also certainly not buy the fact that simply because oil hit an arbitrary target ($100 today isn't a $100 tomorrow or a $100 last year) implies economic woes down south. In the spirit of a new year, I'll briefly paint out what I see coming for 2008. There will be various shocks. Many trees will be felled with the words of many commentators. The more modest among us will restrain ourselves to wasting electrons. Regardless of what prophecies of doom unfold, the world economy will prove, as always, to be an amazingly flexible beast and manage to hang together in one piece. Happy? I remain eternally optimistic about the magnificence of human economic behaviour. EDIT: I realize there are some concerns about that 5% looking statistically indistinguishable from zero after accounting for population growth (and arguably environmental degradation, among a host of other factors), but I subscribe to a belief that net GDP increase is a good thing, even if per capita GDP is constant. This stems from certain tidbits about spillovers - a larger economy should be able to produce more innovations, which are nonrival, and thus foretell higher future rates of per-capita growth than a smaller economy with identical present per-capita growth.